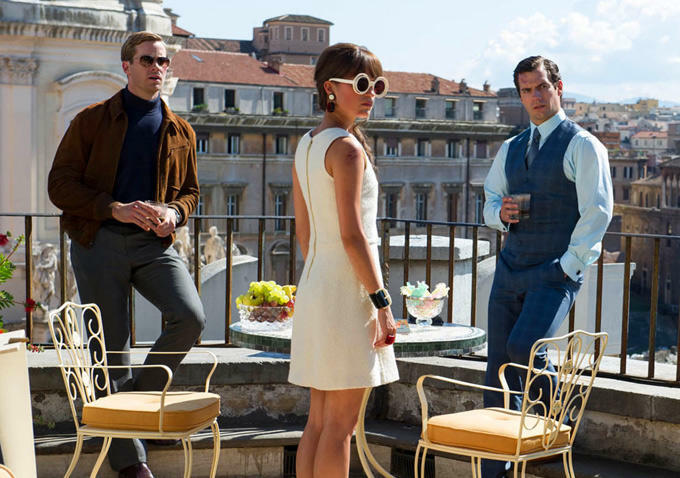 The Reviews Are In: The Man From U.N.C.L.E. We’ve gotten to know each other pretty well by now, right? Ellen and I have publicized most of our pop-culture proclivities (ALLITERATION! ), and we’ve held very little back. Here’s another confession for the books: we go bananas for 60’s spy thrillers. James Bond, Funeral in Berlin, Notorious. The hairier the chest, the shorter the swim trunks, the happier we are. So when we heard about Guy Ritchie’s new spy thriller The Man from U.N.C.L.E, starring Henry Cavill (he of the chin that cuts glass) and Armie Hammer (he of cartoon eyelashes) we had difficulty keeping our trademark cool (joke). spies, so he gave us three of the most watchable spooks since… ever. Henry Cavill plays Napoleon Solo, a Bond-type company man who is carrying out a sentence of indentured servitude to the CIA. In an effort to avert a nuclear apocalypse (as per ushe) he teams up with (gasp!) KGB Special Agent Illya (Armie Hammer) and East Berlin refugee Gaby (Alicia Vikander). World saving ensues. I’ll be the first to admit that the story here is a little light. But the movie is so stylish and fun to watch, I found myself not caring. The dynamic between Nalopeon and Illya is hysterical (you know, typical American-Russian tom-foolery), and Armie Hammer and Alicia Vikander have some of the best on-screen chemistry I’ve seen in a while. My only complaint? Resident super-villain Victoria (Elizabeth Debicki) didn’t really strike fear into my heart as I’m sure was intended. More Femme Fatigue than Femme Fatale, if you feel me. Also, Jared Harris should be legally prohibited from doing an American accent. Ever. I know this movie has snatched some pretty mixed reviews, but I’m begging you to go see it. I promise it will be the most fun you’ll have at the movies this summer. I saw it too and you are exactly right Whitney! I especially liked the wooden speedboats and all the 60’s design details.